Watch Dior Chiffre Rouge M05: gently, the red light! 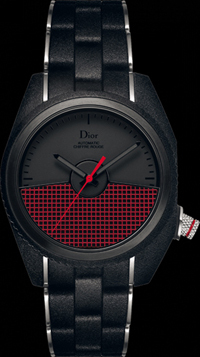 Fashion house Dior has announced the release of a new watch models Chiffre Rouge M05 with tinted bright red back cover, reminiscent of the stop-signal lights. It is difficult to say what the message encoded in the French company design. Maybe a red light on the hand to remind you to be vigilant and cautious? Design innovations built on a combination of three colors – black, dark gray and red. The case, bracelet and bezel are made of stainless steel with black rubber coating. 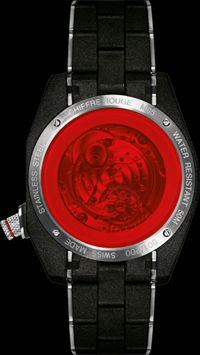 The dial is colored dark gray, and above it is free to rotate the rotor self-winding, designed as a red mesh. Watch Dior Chiffre Rouge M05 are equipped with a display hours, minutes, seconds. Central arrows indicate the time, made in the colors of the dial.